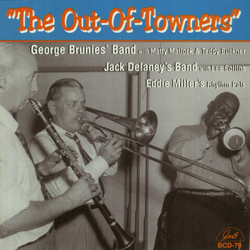 Trombonist George Brunies and his New Orleans All-Stars are captured in this 1955 session playing the tracks - Bugle Call Rag, Closer Walk With Thee, Down In Jungle Town, Alice Blue Gown, Chimes Blues, Bugle Call Rag. Trombonist Jack Delaney and his New Orleans Jazz Babies were captured in 1953 playing - Who's Sorry Now, Careless Love, Bucktown Drag, Who's Sorry Now, Basin Street Blues. Saxophonist Eddie Miller and his New Orleans Rhythm Pals are represented on this collection with a 1958 session.